Learn here how to fill the CL-146 and CL-146XL cartridges, follow all the steps and if you have any questions, type a comment. Seen before in this blog posting for refilling the cartridge PG-145 black, he has spoken of the changes made by the manufacturer of these cartridges, but explained the correct filling of these cartridges both black as the tricolor. 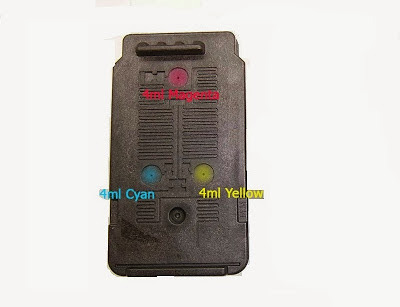 As you can see in the picture, only provided this cartridge in each color about 4ml ink is important to know that these cartridges use ink based on water — the easiest to get — you must remove the label to fill the cartridge even know where the colors are. This will not damage the label should be placed after cartridges, do the larger than usual hole, just insert the needle of the syringe albeit with difficulty but do it this way so that the cartridge eject the air or ink unnecessary by the injectors. We recommend placing the ink cartridge in an area that can then be cleaned or you do not mind spilling ink, these cartridges when filled normally spill ink nozzles. When you finish filling the ink cartridge placed in the printer and run a cleaning head with the printer, or if you can not just print a test page to see the quality we have then filling. If you have any questions or write a comment below, more if you think you should add some content to the publication, it will be gladly accepted.